When you walk in through the garage of our house, you immediately empty into the mudroom. After years of having no proper place for our junk to go at the end of every day (coats, shoes, school and work bags, mail, the random assortment of JUNK that seems to come home with every member of my family every day...! 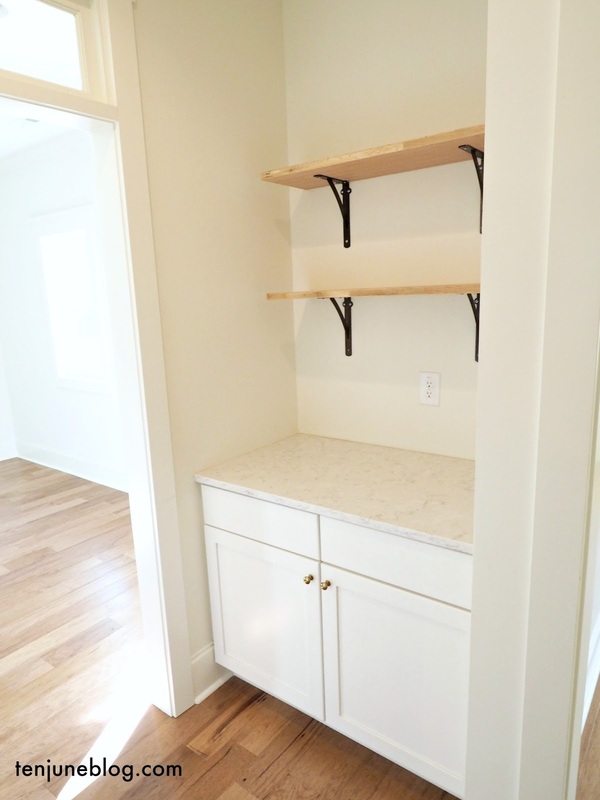 ), one of the first things I prioritized to design in our new house was the mudroom. I needed a one stop shop to organize, or at least corral, all of the junk. 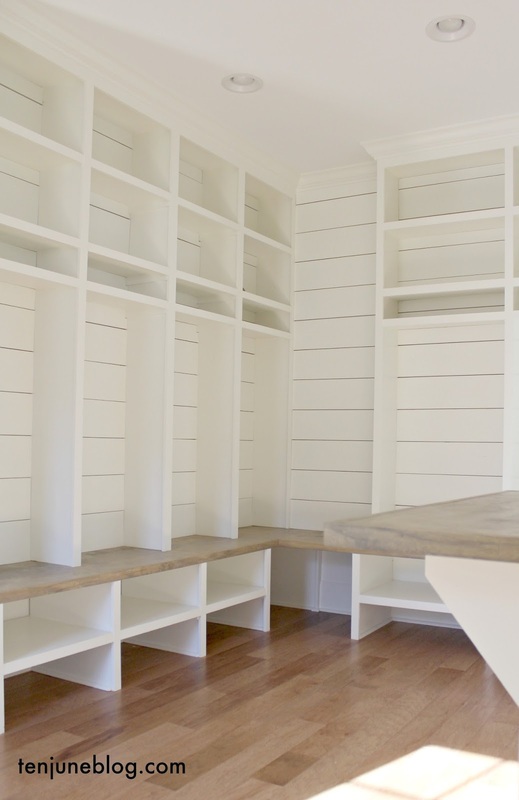 Our carpenters were able to build in six cubbies, which is great for our family of four plus guests. We also have a coat rack for extra guest space. I used the space of the room and simply decided to put as many shelves as I could, where I could. I went ahead and took each cubby up to the ceiling just to maximize functional space. Not sure if we'll ever get a basket up there on the top, but it's nice to know we have the option! Then we've got shoe storage under each cubby and the corner is open for things like gym bags and tall boots. Of course, we've added hooks to each cubby since these photos were taken. 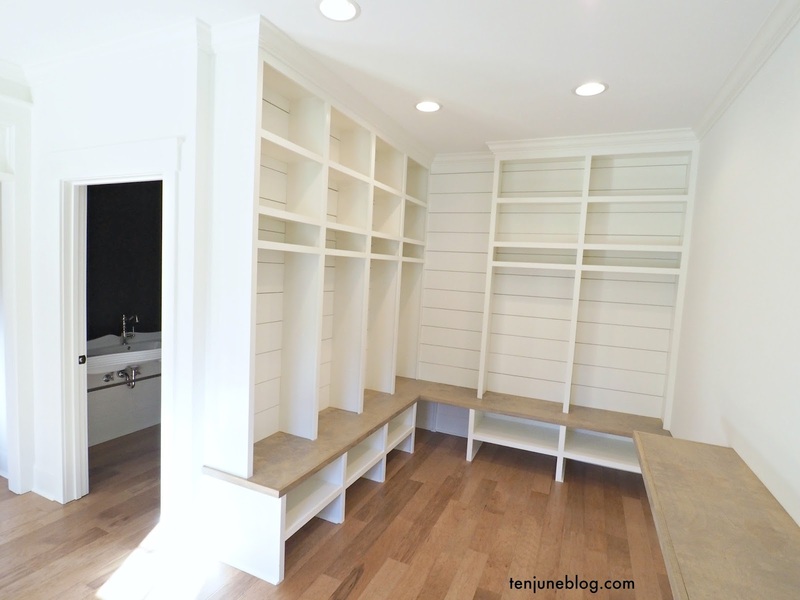 I absolutely love that our carpenters used some extra shiplap left over from the keeping room to dress up this space. 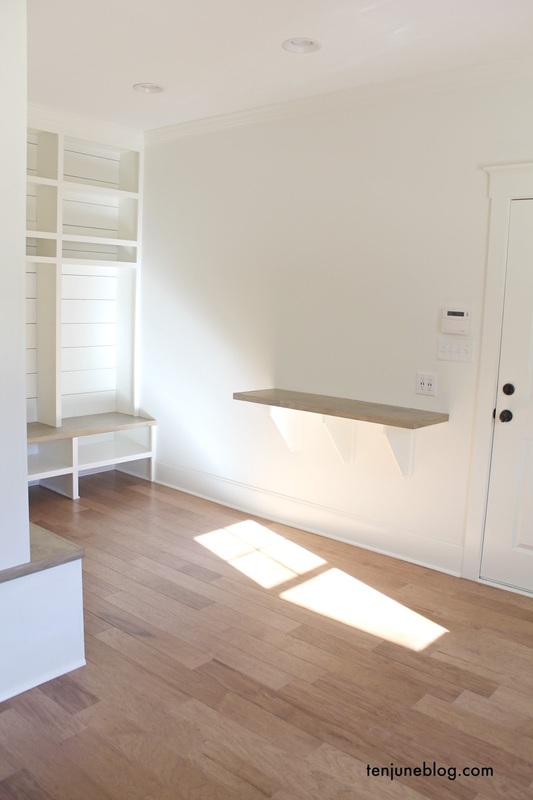 We also had the carpenters add a "drop desk" right next to the door into the garage for keys and mail. Tucker now has his dog bowl and a basket of his doggy items underneath that space. Everyone's got a place for their stuff now! 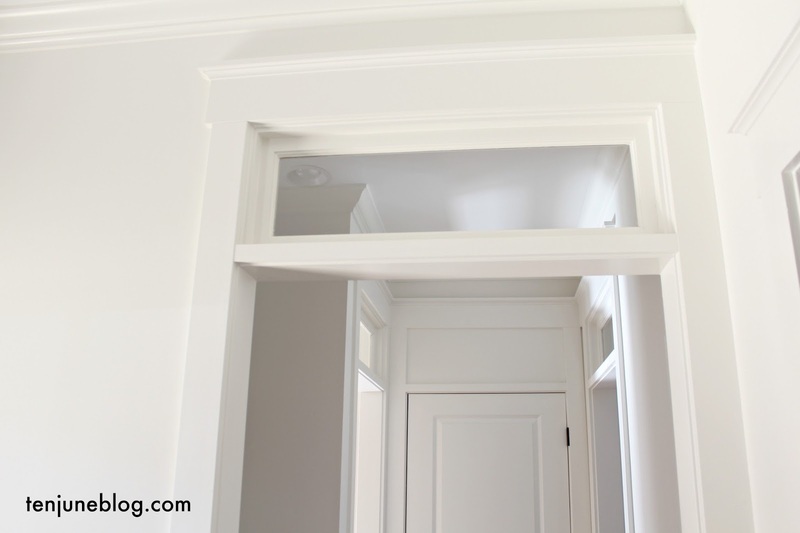 (high five) The good stuff is in the details, and I love those little transom windows we added above the doorway into the hallway as you walk from the mudroom into the butler's pantry/kitchen/dining room ahead! Gives this new house that old school character. 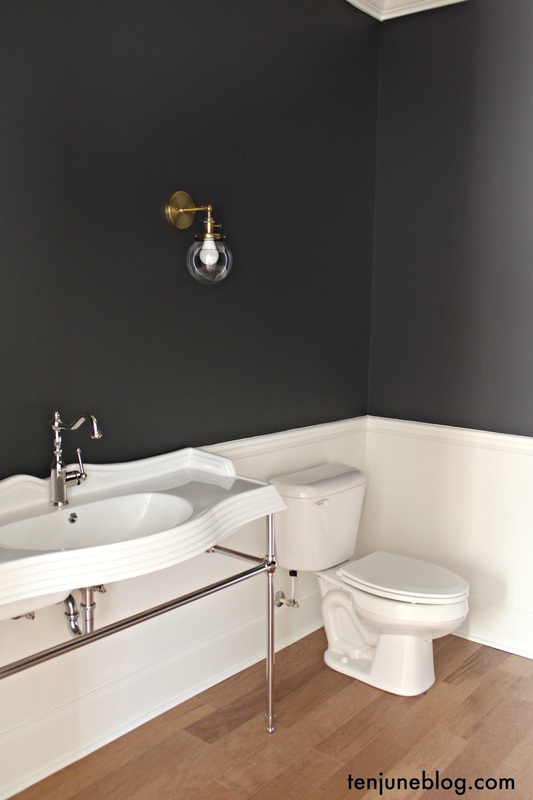 Next to the mudroom space is our powder bathroom. 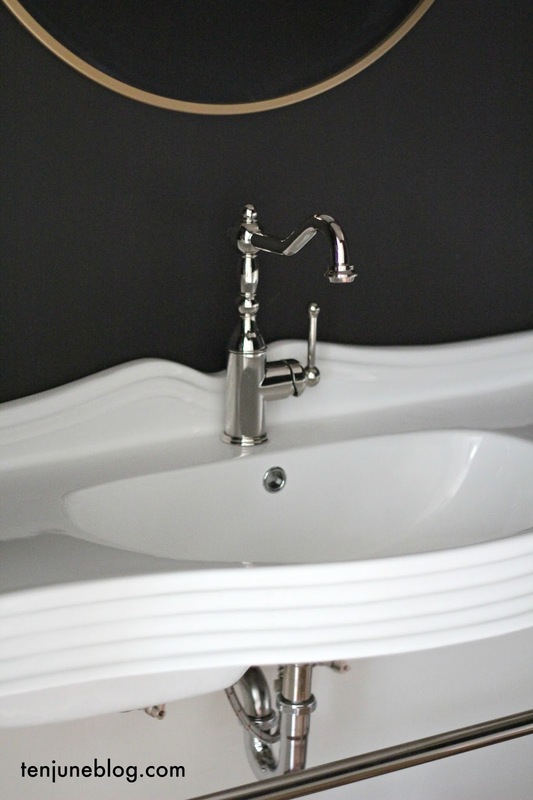 If you remember waaaaay back when, I created a design board here of my dream powder bathroom. Well, this is my attempt at making that space come to life! 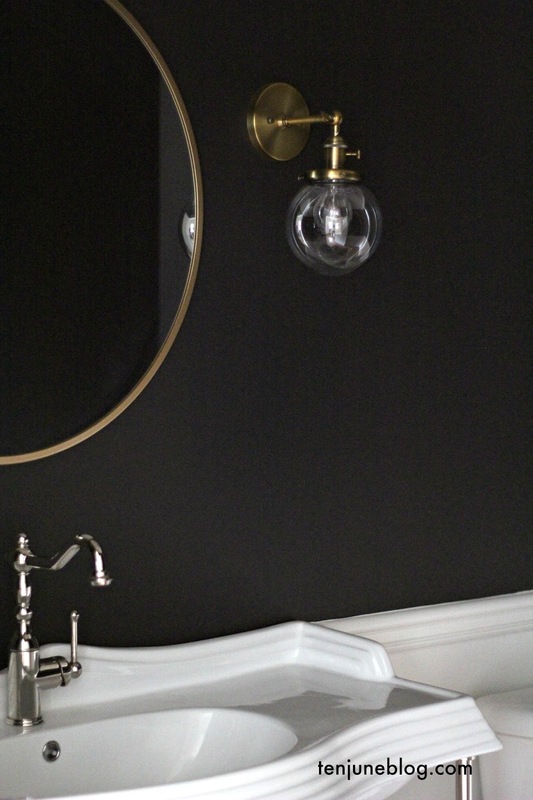 Black walls with glossy white trim, a vintage looking leggy porcelain sink and gold fixtures. Nailed it! And of course, I've got a vintage red rug in there now just tying that mood board up with a big bow : ) The powder bathroom is realllly hard to photograph (no windows!) but it might be one of my favorite rooms in the whole house. It's just so fun to see a vision I've had for so long finally come to fruition! 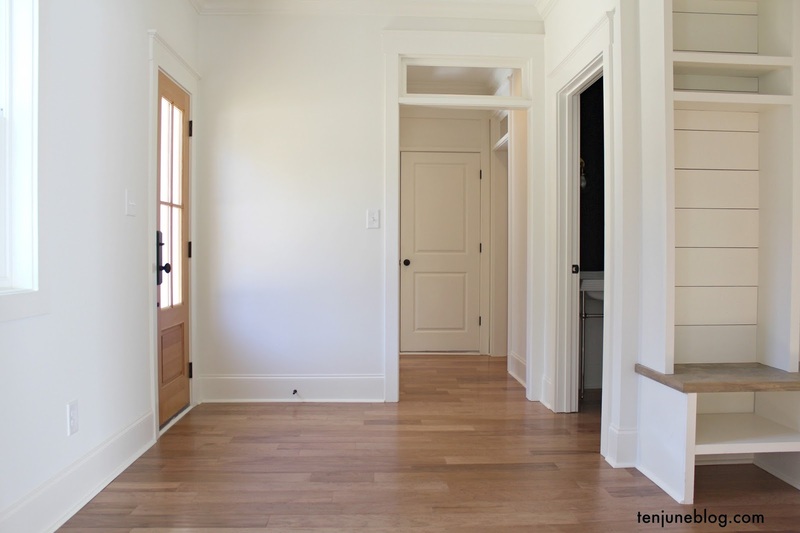 Once you walk through the mudroom and past the powder bath, you're in the hallway between the dining room and the kitchen. We added a little butler's pantry there with some open shelving. 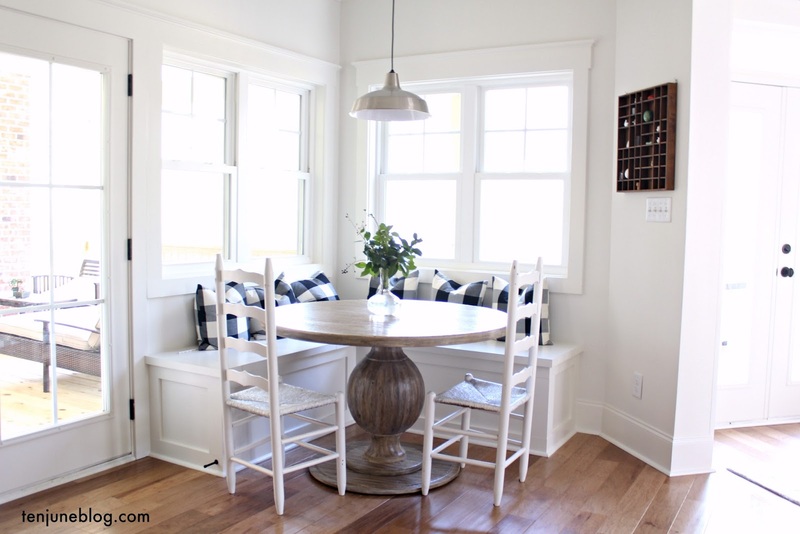 It's the perfect place to store entertaining items we don't use all the time. And I hope to make this a drink station when we're hosting large groups. My Master Bedroom and Closet- A Blank Slate!